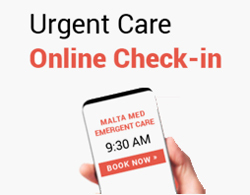 Check-In Online at Malta Med Emergent Care! Do Your Waiting at Home! We are now 7 weeks from our first offering for patient’s to ‘Check-In Online’ and do their waiting at home. This is a feature of our Urgent Care, where patients can navigate to our website, take a look at timeslots available at MMEC and reserve a spot in line. Our Nurse’s acknowledge the patient’s request, review their symptoms and the patient is added to our Pre-Arrivals Board, letting staff know they should expect the patient at the requested time. This new feature is a response to patient requests and desires to reduce the amount of time they are waiting while at MMEC. Ideally, the patient is doing their waiting in the comfort of their home, and then coming in to MMEC at their requested time. We are aiming to reduce the amount of time it takes for you to see a provider at MMEC and get you in, out and treated appropriately! Our available times on our website are flexed up and down according to how busy our Urgent Care becomes. As a reminder, we are available overnight, where the Doctor is always in to treat your condition! Please visit our Urgent Care Check-in page for times and more information on this exciting new offering from MMEC.